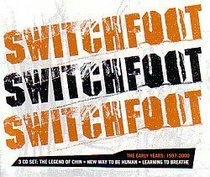 Now, for the first time, Switchfoot's first 3 albums are packaged together in a double jewel case, including the original booklets from each album and all the songs from the original releases. With 3 full albums on 3 CD's, 32 songs and almost 2 full hours of music, there's no better time to discover Switchfoot in a whole new way. About "Early Years:1997-2000 CD Pack"